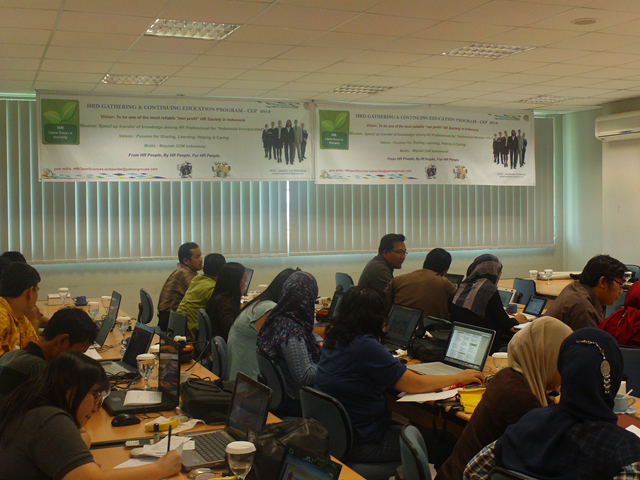 Dokumentasi Talent Management Workshop bersama HRD Community Kota Medan. 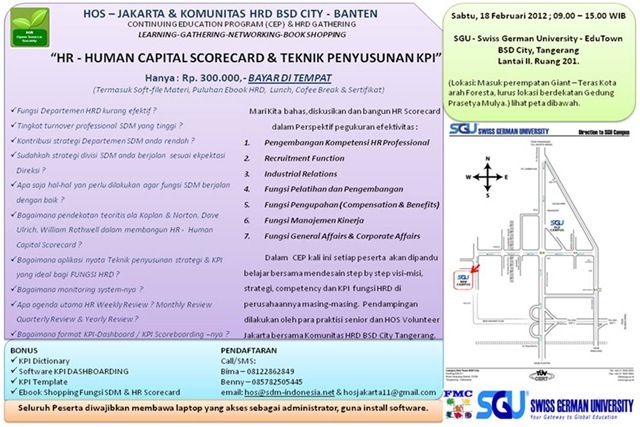 Membahas tuntas Talent Management, Assessment Plus 32 dan Behavioural Analyst menggunakan DiSC. 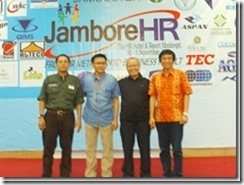 Jambore HR @ Sibolangit, Sumatra Utara. [BSD CITY]. Selamat sukses buat HOS Jakarta Gathering, sebanyak 40 orang praktisi HRD berkumpul di Swiss German University, Sabtu 18 Februari 2012 (09.00-16.00). Diskusi dan pembahasan berlangsung cukup “HOT”. Sabtu 18 Februari 2012 di Kampus SGU, BSD City, Serpong. Di-click aja gambarnya, biar jelas yah…! Framroze Virjee, Adam KohSweeney. Business Week (Online). New York: Oct 9, 2009. Nine months into the Obama Administration, and 20 months [or so] into the current recession, the business community is justifiably asking itself: "What’s next?" Many business leaders are tracking the long list of potential labor-friendly [aka "business-hostile"] initiatives and litigation trends, including: an expected increase in audit and enforcement activity by the U.S. Labor Dept., the Equal Employment Opportunity Commission, and other state and federal agencies brought about by increased funding; proposals for mandatory paid medical leave and required health and welfare benefits; more equal pay discrimination claims based on the recently passed Lilly Ledbetter Fair Pay Act; a seemingly endless uptick in individual and class-action lawsuits, as millions of laid-off employees explore their options with emboldened plaintiff attorneys; and the resurgence of organized labor in the private sector, regardless of the final form of the Employee Free Choice Act. While each of these initiatives is of valid concern, they are generally beyond the control of individual employers at this juncture. So perhaps a better concern for employers these days is: "What am I missing as I lay off or rehire employees?" Here are three key possibilities. First, employers need to properly assess the statistical effect of their employment decisions. Both the U.S. Supreme Court’s recent decision in Ricci v. DeStefano [the firefighter promotional-testing case] and the confirmation hearings of now-Justice Sonia Sotomayor have pushed "disparate impact" issues front and center in the current national debate. Discrimination against minority employees is often thought of as an issue of intent — "As long as my motives are not discriminatory, I am not discriminating and I will be fine, right?" Not necessarily so. Unlike disparate [discriminatory] treatment cases, disparate impact claims are based on statistics, without regard to intent. The question at the heart of these claims: Did the employer’s policy or practice disproportionately affect a protected class of employees? This means that employers need to consider carefully the statistical impact of layoff decisions. And, on the other end, when rehiring after a layoff, the same issue should be considered. Enterprising plaintiffs’ lawyers may argue disparate impact if the minority makeup of your company looks markedly different post-rehiring compared with pre-layoff. It is worth noting that the Ricci case has left many employers in a no-win situation. In that case, the New Haven Fire Dept. would almost certainly have been sued by minority employees if they had used the promotional test results at issue [a test on which minorities disproportionately scored lower]. Instead, they were successfully sued by white employees when they didn’t use the results — highlighting the need for careful consideration of employee testing issues. Company compensation practices present another area of vulnerability when hiring or firing employees. Despite the well-publicized explosion of lawsuits alleging failure to pay overtime and other "wage and hour" violations, many employers remain blissfully unaware of the complicated, treacherous, and arcane rules surrounding employee classification and compensation. Importantly, federal law in this area has no preemptive effect — which means employers must consider federal, state, and sometimes even local law when deciding such issues. When terminating employees, key concerns include whether the employee is owed commissions or bonuses [forfeiture provisions or policies are not always lawful] and how quickly final wages must be paid [several states require immediate payment in some circumstances]. With regard to hiring or rehiring decisions, recognize that this is the single best time to assure that all planned compensation approaches — including whether the employee is entitled to overtime under applicable law — are lawful or at least defensible. Lastly, perhaps the most important consideration when hiring or terminating an employee is not really a legal issue at all — it is the so-called "human touch." The fact is, plaintiffs’ attorneys rarely file suit over the issue that first drove the employee to visit them. Rather, they leverage the opportunity that a disgruntled employee presents to explore the employer’s practices and the employee’s experiences to identify and isolate those factors that can be "spun" into a claim. Thus, employers should consider whether their decisions could drive the employee into the arms of a plaintiffs’ lawyer [or, for that matter, the arms of organized labor]. The best advice: Treat employees with respect and civility, and don’t lose sight of the forest for the trees. 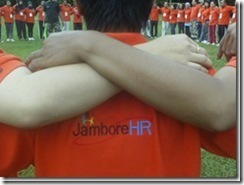 It is often prudent to be flexible and meet employees halfway where possible, even when not strictly required. Keep in mind that a minor concession, an accommodation, or a little extra effort early in the process will often head off the major issues before they surface.